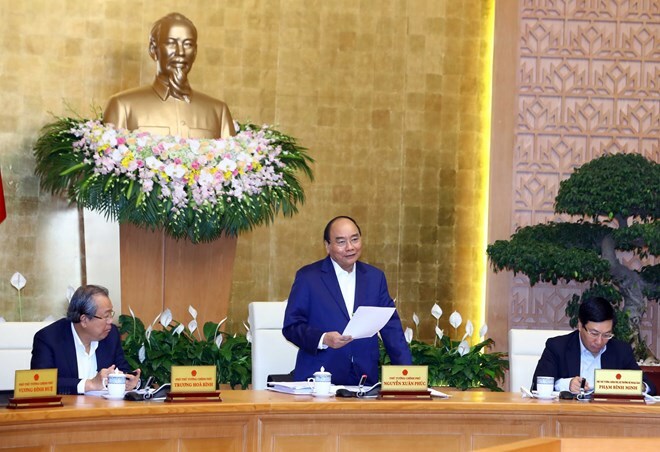 Hanoi (VNA) – Prime Minister Nguyen Xuan Phuc has requested all-level authorities and sectors seriously implement his freshly-issued Directive 09 on solutions to remove obstacles to production and business activities so as to achieve this year’s growth target. He made the order while concluding the Government’s monthly meeting on April 2. The Cabinet leader asked the Ministry of Planning and Investment to prepare detailed growth scenarios in order to make proactive management moves. Meanwhile, the Ministry of Industry and Trade is required to keep a close watch on impacts of international issues, including trade tensions, on the domestic economy and propose solutions to capitalise on opportunities created by free trade agreements as well as the domestic market with nearly 100 million people, he noted. At this meeting, PM Phuc pointed out six growth drivers this year, including removing difficulties and facilitating agro-forestry-fishery production and export; making good use of chances created by the Comprehensive and Progressive Agreement for Trans-Pacific Partnership (CPTPP), diversifying markets, promoting export and reducing trade deficit; and promoting processing-manufacturing and closely monitoring businesses’ activities and big projects so as to tackle hindrances to them in a more timely manner. Another measure to fuel growth is fostering the development of services, especially wholesale, retail, logistics, tourism, IT, financial and banking services. Additionally, it is necessary to speed up the disbursement of public investment capital. The last and also most important driving force is continuing to strongly and substantively improving the investment and business climate, particularly removing institutional obstacles that are hampering development, he added.